I had to order another tea cup to replace the one I lost in the November earthquake. 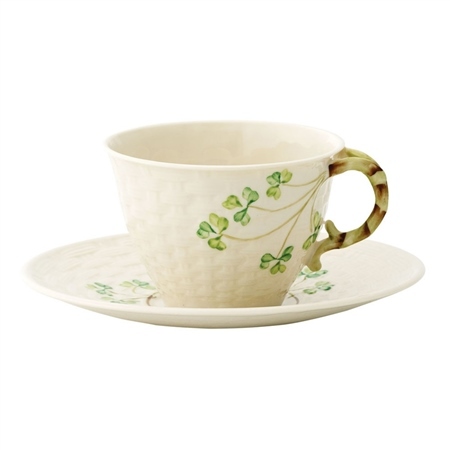 I love this tea cup, have to have one on my shelf- more securely fastened down this time. Thanks for making these beautiful items! I wanted to get a tea cup to match the tea pot and sugar, and cream set that I had passed down to me from my mother who was born in Clare, Ireland in 1911. I bought this new tea cup and when looking at the shamrocks, thought that they were larger, not as finely done as my teapot. I was not happy to see this. Did yu make the shamrocks bigger?